Delicious when served with the Yorkshire Pudding or the Red Wine Pepper Sauce. Try this dish with Better Than Bouillon Reduced Sodium Roasted Beef Base. SAME COOKING TIME AND TEMPERATURE APPLIES WHEN USING A CONVENTIONAL OVEN. Add the water, Roasted Beef Base, red wine, Roasted Garlic Base and thyme to a large bowl. Whisk to combine. Add the rib roast to the bowl, fat side down. Cover the bowl tightly and refrigerate for 10 hours. Preheat the Big Green Egg® to 425°F. Set EGG® for indirect cooking with the plate setter and porcelain grid. Add the butter to a small sauce pan and melt over low heat. Add the Roasted Beef Base, shallots, garlic, pepper and herbs de Provence and cook for 1 - 2 minutes. 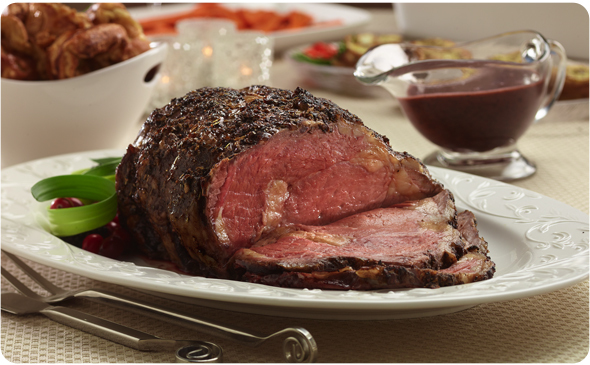 Remove the rib roast from the brine and place in a grill-proof pan. Rub the rib roast all over with the butter. Place the pan directly onto the porcelain grid and roast for 20 minutes. Lower the temperature of the EGG to 350°F and continue to roast for 2 hours or until the internal temperature reaches 125°F when checked with an instant read thermometer. Carefully remove the roast from the EGG and let rest for 10 minutes before serving.